A karate birthday party for kids offers a less common theme that celebrates the child's interest in martial arts. Use the karate theme to plan the party details. A karate party brings to mind lots of active kids with energy to spare. A small home creates space issues for the party theme. If the weather is warm, a backyard or park is an option that allows the kids to move around. Another option is to hold the party at a local martial arts studio. Inquire about holding a birthday party at the facility. They may even offer demonstrations or instruction for a few simple moves. Homemade invitations allow for customization to fit the theme of the party. White cardstock cut into the shape of a karate uniform top is a simple option for the party. Write the details of the party on the back. Tie a black ribbon around the waist of the shirt to represent the karate belt. If you hold the party at a martial arts studio, you won't need many decorations. Ask about decoration restrictions before purchasing anything. They may limit things such as confetti and streamers that often leave a mess. Parties held at home are free for any type of decoration. Adding karate decorations transforms a backyard or living room into a karate paradise. Red, white and black are colors typically seen in the martial arts theme. These colors are readily available in party supplies such as tableware, balloons and streamers, making it easy to establish the party color scheme. A banner welcomes the guests into the party area. To infuse the theme into the banner, use it to welcome the guests to the birthday child's karate school. For example, you might write, "Welcome to Joey's Karate School". You can also use the child's last name on the sign. The karate uniform often comes to mind with this theme. Hang a uniform on the wall or cut one out of cardboard. Add a colored belt to the uniform. If the birthday child takes karate lessons, display her belts on the wall as part of the decorations. Dragons are another symbol often associated with martial arts. Add dragon decorations around the party area in the form of wall hangings, piñatas or table decorations. Favor bags filled with karate-themed treats add to the decoration in the room. Choose a variety of small treats such as dragon tattoos, stickers and plastic karate figures. Miniature karate belts cut from colored fabric add a themed tie option for the bags. Planning a variety of activities helps the young guests channel their energy to something productive. Breaking actual boards with young kids sounds like a lawsuit waiting to happen. Pieces of Styrofoam allow you to simulate the board break stunt often performed in martial arts. The Styrofoam breaks easily to prevent injuries to little hands. Make extra Styrofoam boards so each child can take a few turns to show off her strength. A relay race with a karate twist helps the kids burn off energy. Secure a karate outfit, complete with a headband and belt. You'll need one for each team. The first child dresses in the outfit and races around a cone at the opposite end of the yard. He returns to the starting line where he takes off the outfit and passes it to the next child. Each child takes a turn dressing in the karate outfit and racing around the cone. Provide each child with a headband. A long strip of fabric works well for a homemade karate headband. The kids use fabric paint to personalize their headbands. This is a good opening activity so the headbands have a chance to dry during the party. 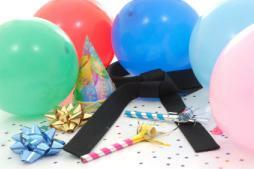 A karate birthday party serves up fun by incorporating the birthday child's hobby. Find customized ways to add the karate theme throughout the party planning process to create a well-rounded theme party.